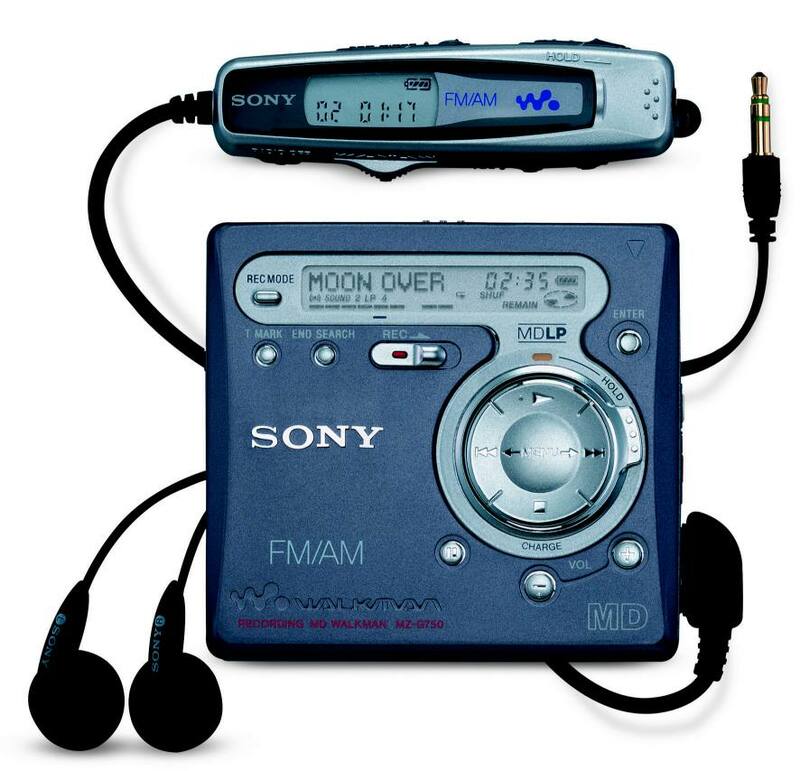 Features: Similar to MZ-R700 but includes AM/FM tuner (in remote). MDLP capable, G-Protection anti-shock, digital and analog recording level control, Manual End Search/Auto End Search. Tuner contained entirely within LCD remote control, hence cannot record from tuner. Internally the MZ-G750 differs from MZ-R700, containing 5 additional ICs and several circuitry changes (see the service manual for details). User comments: Mark Litgenstein: The MZ-G750 is exactly the same size as the MZ-R700, the only difference is the headphone out, which comes with power out to power the remote. The remote includes the radio, the player doesn't. So you can't listen to the radio without the remote, but you can listen to MD without the remote. I can really recommend this unit. It's not cheap, but the radio is a very welcome addition. A table of feature differences between the Sony MZ-N1/910/909/900/G750/N707/R700/N505/R500 machines. AVLand has information on the MZ-G750. Mark Bausch scans in pages from the Spring 2001 issue of Sony Style magazine that describes the MZ-G750. Peter Ravn has put together a review of the MZ-G750. 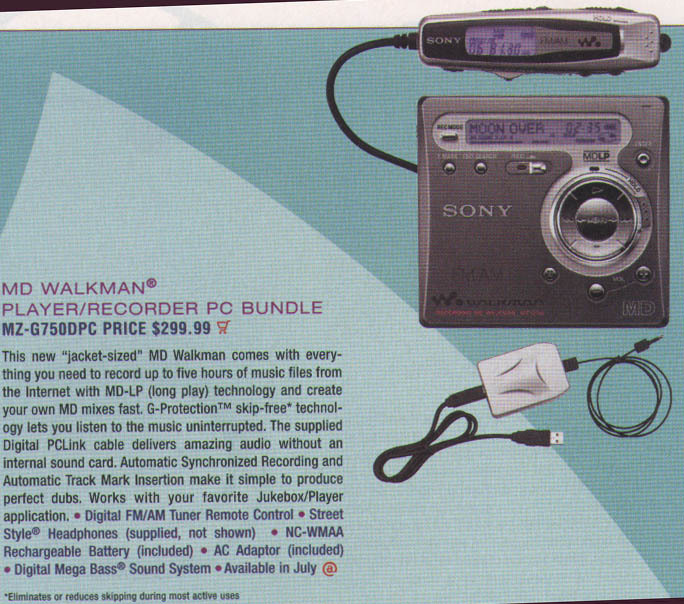 Pages from the Spring 2001 issue of Sony Style magazine describe the MZ-R700 and MZ-G750. 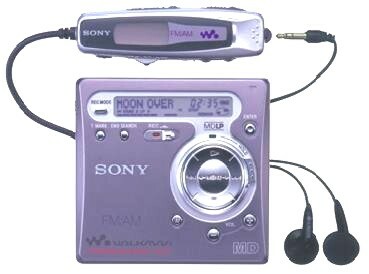 An official Sony press release states that all of 2001's MDLP portable recorders (MZ-R500, -R700, -G750 and -R900) will be available in the United States. 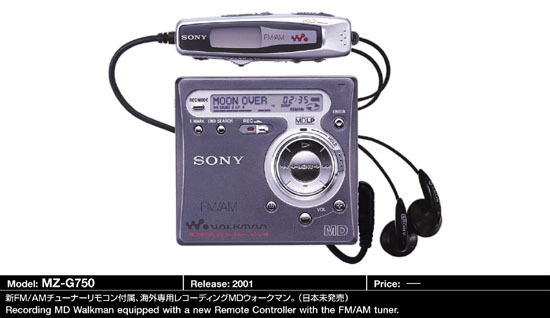 Video-direct's comparison table lists this unit and other current Sony models. CNETAsia review of the MZ-G750. HiFi Choice review of the Sony MZ-G750.